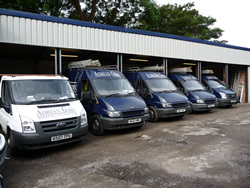 Established in 1986, Adrian Gibbs Roofing Limited is a family run business which spans two generations. The business operates from a purpose built office complex situated in lower Pontypool. We currently employ 12 roofers who are fully trained and certified beyond industry standards to apply the roofing systems we use and follow the strict Health & safety guidelines we have in place. Our office is managed by dedicated employees who deal with work scheduling, invoicing, customer services and enquiries. We are a specialist flat roofing company with expertise in felt, fibreglass roofing and single ply systems and the main bulk of our work is concentrated in this area. We also provide expertise in flat roof leak detection and roof surveys. Much of our work comes from a diverse range of local authorities and large organizations such as International Rectifier where we carry out maintenance contracts. We also serve the local community supplying roofing services to homeowners and businesses operating throughout South & West Wales.